Though you might think that “dental” and “fun” go together like “root” and “canal,” you might be surprised. About 30 dentists from across Canada and at least one dental hygienist attending last week’s Canadian Dental Association conference in Charlottetown, P.E.I. participated in an early-morning 5K fun run on Aug. 23. And it only happened thanks to local dentist and runner Dana Coles, who took it upon herself to get the runners in the group of about 700 dentists out of the hotel to indulge their favourite hobby. “Sometimes there is a run event at the convention, but because it’s in a different location every year, it really depends on someone being willing to organize it at the local level,” said Coles, who had no prior experience organizing a race. And the challenges of organizing a race went beyond the usual tasks of securing swag, alerting local authorities, and ordering shirts. “The convention schedule is very full,” says Coles, who had to keep her fingers crossed that runners would actually come out to an early-morning race. Coles ordered bright yellow T-shirts for the runners, to ensure they would be seen in the dusky light of early morning, featuring the convention slogan “Take the Bridge to Better Dentistry.” “I wanted people to have fun and be safe,” says Coles. Three Taiwanese tourists, none of whom were attending the convention, also registered and ran. It was a gorgeous morning, which helped. 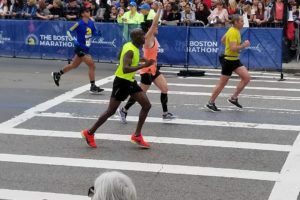 Coles admits that organizing a race is full of things runners take for granted, but that take time to facilitate, such liaising with municipal authorities and local police. “I definitely prefer running to organizing,” she says, “but overall it went really well.” Coles, who has run two full marathons, is training for the P.E.I. half-marathon on October 14, as well as a 50K race in Nova Scotia next year. Next year’s Canadian Dental Association meeting will be held in Saskatoon.